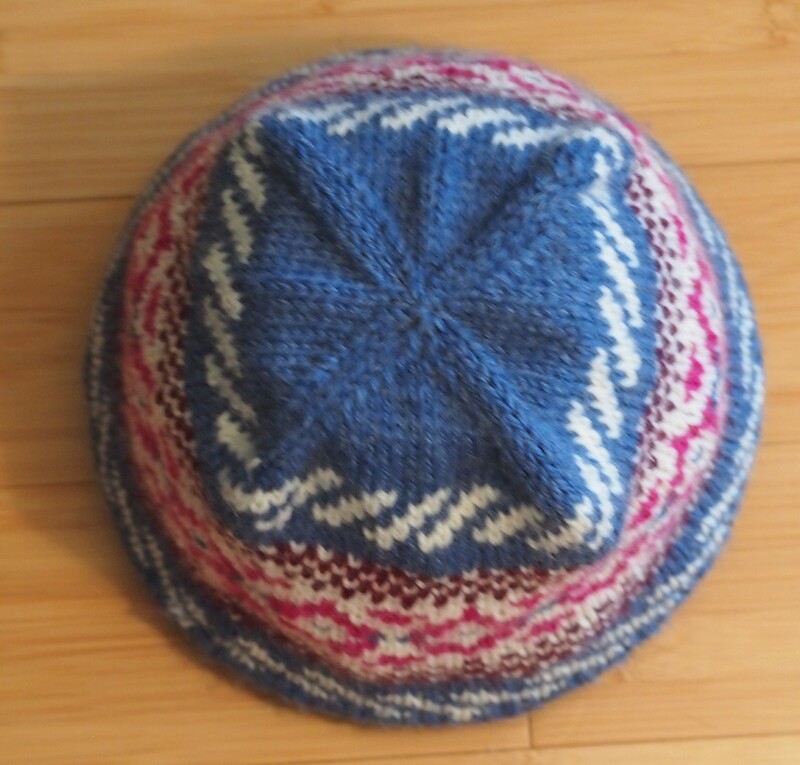 After I had the basic hat made, I broke into my “stuff” cupboard and got out a 2″ (2cm) wide strip of leftover crepe bias which I gathered the edge of and put around a vintage button I picked up at the knitting guild vendors night. Then I used pairs of peacock feathers that NIcky and Suja brought me back from India. I put the pairs back to back so they are nice from either side and put them in behind the button. This is NOTHING like the plan I had when I went into the stuff cupboard, but I am happy with the result. I remember when I was doing my diploma in ceramics, I used to drive one of the professors crazy at the crits because she was an “artist” who believed you had to draw a picture of the finished pot before you started throwing the darn thing. She would ask me why I did things to the pots and all I ever had to say was “because I thought it would look good” or “I kept doing stuff till I thought it looked okay”. Needless to say, my pottery never made it to galleries. Top: Cast on 4 stitches, purl one row, turn, Increase one stitch in each stitch (8 stitches). DIvide onto 3 needles. Knit one round plain. Increase one stitch in each stitch around (16 stitches total). Knit one round plain. Knit one, increase one around (24 stitches total), Knit one round plain. Knit 2, increase one around (32 stitches total). Knit one round plain….continue until you have 112 stitches ending after the plain round. Cast off loosely. Put through washer and dryer twice. Pin top down onto the bottom every 1/2″ (1 cm), then sew together using a ladder stitch. Embellish as desired. This entry was posted in felting and tagged felted hat, felting, knitted hat, knitting, knittting and crochet, Patons Classic Wool on January 31, 2014 by gillianknitter. This is a basic felted hat I have been working on. I had been planning on using my embellishing machine to play with the surface of it but I like it plain for now. I may do another one and play with it. Since it is straight knitting it can be done anywhere. Heather and I are getting along a lot better lately. She is only providing constructive criticism these days…not such good copy but a much calmer homelife in general I must say…Not to worry, she is 17 and I am me so I am sure we will be able to tick each other off again at some point… The purple bow accent was her idea and I think it is nice. 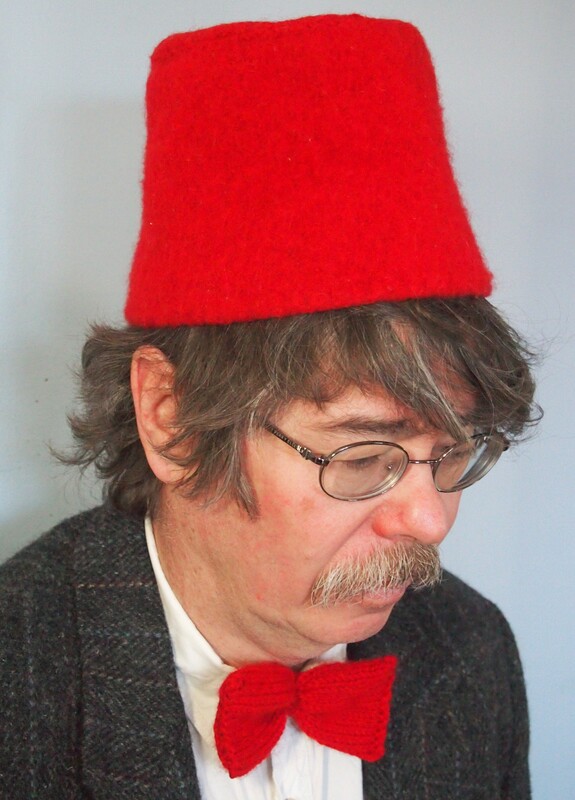 It is the same bow tie as I made the other day to go with the Dr. Who fez. Keep going this way doing your decreases every third round until the round that you do knit 15, slip 1 knit 2 tog, psso around. At this point you start only putting one round in between your decrease rounds instead of two. At the point where you have done knit 3, then your decrease around (i.e. 20 stitches left) it is time for the rapid descent or you will end up with an elfen point. When I got down to the 20 stitch mark, I just kept knitting 2 together until I had about 7 stitches left, then cut my thread and ran the end through and pulled it tight. I sent it through the washing machine twice and the dryer once in between. If you look at the pictures close up you can see that there is still some detail in the stitches visible. You would have to cast on more stitches if you were planning to felt it completely and make the fabric indistinct. I dried it the second time on my hat form. A cheap alternative to a hat form is a Styrofoam wig stand you get from a beauty supply place. If you were going this route, I would put the hat on my head and tell it where to go before I let it dry on the Styrofoam head. Bow: Patons Classic wool 4 1/2 mm needles. Cast on 26. Divide onto a set of 3 needles. Knit 12, p1 until it measures 4″(10cm). Cast off. Sew up ends with purl stitches running down the sides and cinch the middle. This entry was posted in felting and tagged felted hat, felting, knitted hat, knitting, Knitting and Crochet, Patons Classic Wool on January 28, 2014 by gillianknitter. I have figured something out over time while I have been doing some of these felted hats. I may have been told these things somewhere back in the distant past and forgot them, but I will never forget them again. There are two major contributing factors to the shape of a knitted hat, only one of them being the stitches that are put into it. Any knitter that has blocked a lace shawl (or a sweater for that matter) knows the power of the pins. Felting in the washing machine and dryer is no different but you are not in there with the stuff to control things and there is no board to pin things on. It now looks quite a bit like the 20’s style cloche I was originally trying for but thought I had failed miserably at. I also had only put it through the wash and dry once. It really felts a lot the second time through. Actually often it seems only two washes with a dryer in between is enough; take a good look after the second wash and decide if you really need to put it in again or not. Things seem to depend on water temperature (hotter felts more) and the amount of other laundry in there with it (space to move felts things more). This entry was posted in felting and tagged felted hat, felting, knitted hat, knitting, Knitting and Crochet, Patons Classic Wool on January 26, 2014 by gillianknitter. I started chatting to a woman I met a couple of weeks ago about my hats because I was knitting and she was crocheting. I said that I didn’t follow patterns anymore but just figured it out as I went along. 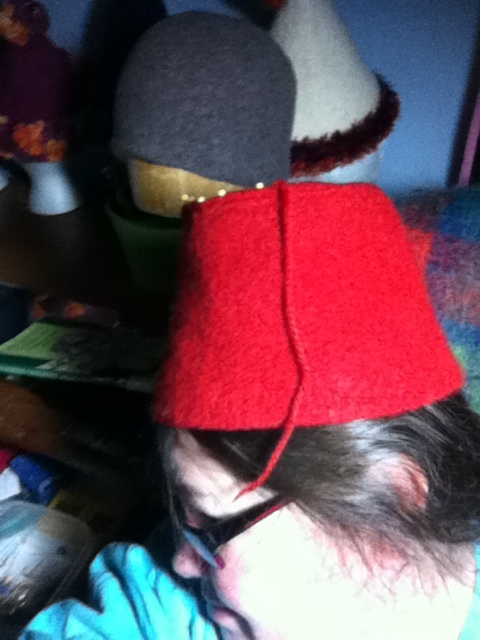 She asked if I could do a Dr. Who fez for her. My immediate reaction (internally) was wow that sounds hard..don’t they have a flat top? I can’t do that…Outwardly I deflected her with ‘oh, I don’t know…don’t hold your breath’. I went home and looked up a picture and realized that I had been making some pretty solid hats lately with the New Years Party hats and the Halloween Witch hat, so I had a pretty good idea of how to make a hat that stood up by itself. I have also made A LOT of shawls and doilies, so I figured that I only had to figure out how to make it solid instead of holey…and I said to myself CHALLENGE ACCEPTED!! Unfortunately, there appeared to be an eastern Ontario wide shortage of bright red Patons Classic wool that week. I tried every Michaels store in Ottawa and even phoned down to Brockville. The nice lady on the phone in Brockville told me that a shipment was due in the next week, so I figured that would be the same for Ottawa so I just decided to do a trial run on the top in another colour while I waited (patiently). Patience is, after all, my middle name, lol. I have been vaguely aware of Dr. Who off and on all my life. I was a child in England when the show first started 50 years ago (gasp) and it has come in and out of vogue (and hence my consciousness) ever since. I have seen episodes here and there but have never followed it like Star Trek or some of my other deals. When we were trying the hat on Alan, I was musing about how Dr. Who kept it on his head. For this, I got from Heather a heavy sigh and a roll of the eyes…’he is not called Dr. Who mom, the show is called Doctor Who, he is called The Doctor’…oops,..I stand corrected…. Cast on 130 stitches on a circular needle. Do two rows of k1, p1 ribbing, then switch to straight stocking stitch (knit every stitch. When your work measures 1 1/2″, 3″, 4 1/2″ 6″, 7 1/2″ and 8 1/2″, knit 2 stitches together three times evenly spaced around the hat. This means that on 6 different rows you will reduce by three stitches, a total of 18 stitches and thus end up with 112 stitches at the top of the hat. Keep knitting after the last decrease row until your work measures 9 1/2″, then cast off loosely. Cast on 4 stitches. Purl one row. Next row: knit and Increase one stitch in each stitch across (end up with 8 stitches). Divide these 8 stitches between 3 needles and join into a round. knit one row plain. Next round: knit one, increase one around (16 stitches). Do one round plain. Then knit 2, increase 1 around (24 stitches). Do one round plain. Continue in this manner, increasing 8 stitches per round every other round with one plain round in between until you have 112 stitches, then cast off loosely after the plain round. This entry was posted in felting and tagged Dr. Who, felted hat, Fez, knitted hat, knitting, Knitting and Crochet, Patons Classic Wool on January 25, 2014 by gillianknitter. I made this hat when I felt like playing with some colour. I was doing a lot of pattern stitches at the time and wanted a break from that. It is just very simple blocks of colour patterns. I am a bit of a cheater, so I made sure that I never had more than two colours working at a time, that way I could hold one colour in each hand. I find that rows with three colours really slow me down. This hat has a single rolled rim under the bottom blue and white section which joins back in just above that section. It is made from Patons Classic Wool in ends I had of four different colours. 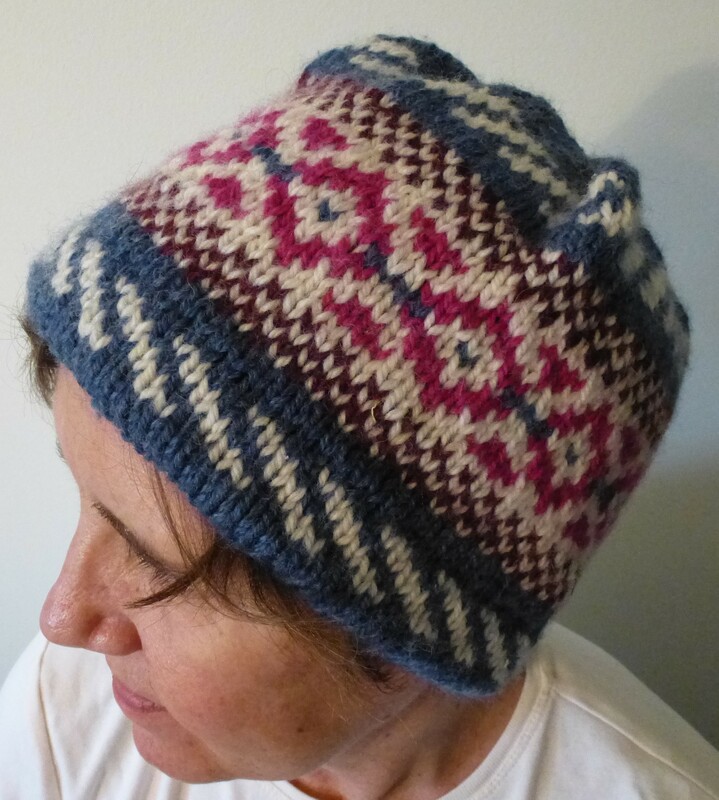 This entry was posted in Uncategorized and tagged knitted hat, knitting and crochet. knitting, Patons Classic Wool on January 20, 2014 by gillianknitter. I have noticed quite a few hatbands around this year and I had the idea to build a hat on a hatband. My favourite hat I ever knit was this type. I made it when I was in university (decades ago) and I loved it. It fit better than any other hat I have ever owned since. I got the pattern from a random magazine like Canadian Living or something. I owned the hat for a couple of years and then lost it. I tried for years to find the pattern again but never did. I have not managed to recreate it by a long shot here, but this is a start. What I did here is start with a tube. I cast on 39 stitches and knit them with my 9″ circular sock/mitten needle. I think I will reduce this to about 35 next time because I think I can still use that needle (I have a hate on for sets of four…all that needle changing drives me spare) but the band won’t be quite as wide, which I think will work a bit better visually. I continued on these stitches until just before it was long enough to go round my head then I did a slip 1 knit 2 together pass slip stitch over around and knit a couple of rounds on the 13 stitches and cast off. I then picked up from the cast on edge and did the decrease, knit a couple of rounds, cast off and sewed the two cast off edges together. After I had the band finished, I used straight needles and cast on 10 stitches. I purled outer two stitches on each side of a 6 stitch cable which I did long enough to go round the center of the band. I used a circular needle to pick up 98 stitches around the band about 3/4 of an inch down and then picked up the stitches from the straight needles as well as the corresponding cast on stitches so that the cable went around the center of the hat band. I added 8 more cables around the hat (purl 6 cable 6 around) and finished body of the hat normally. This entry was posted in Uncategorized and tagged knitted hat, knitting, Knitting and Crochet, Patons Classic Wool on January 14, 2014 by gillianknitter. Most of what I learned from anyone else about knitting hats, I learned from Charlene Schurch. I used to own her book Hats On and, before I started making up my own hat designs, I spent a good year or so knitting and re-knitting hats from it. In this book, she has a wide variety of hat shapes and sizes. She uses both colour work and pattern stitches very effectively. I knitted almost every hat in the book at least once and one particular hat (one that you knit the persons name in), I made over and over again for all kinds of different people. I know I made that particular hat at least a dozen times. This is really the only hat book I ever used much. I think if anyone was going to own only one hat book, this would be a very good choice, even though it was written quite some time ago. I lost my copy years ago and never actually replaced it because I don’t use patterns anymore myself. I ordered it from the library so I could write this post and I realize I am still very influenced by her. This entry was posted in Uncategorized and tagged Charlene Schurch, knitting, Knitting and Crochet on January 12, 2014 by gillianknitter.